A home located mere steps away from the sandy beach. Waking up to a direct view of the shimmering sea that appears to extend from just beyond your bedroom window. An entire afternoon spent relaxing in the sun as the gentle rhythm of lapping waves fills you with a sense of complete serenity. This was once considered a way of life accessible only to the super rich, a luxury that was beyond the grasp of the hoi polloi. In Dubai, beachfront luxury meant owning a palatial villa on the Palm Jumeirah, a community that was built on the idea of exclusivity and prestige, offering a sanctuary away from the commotion of the city. 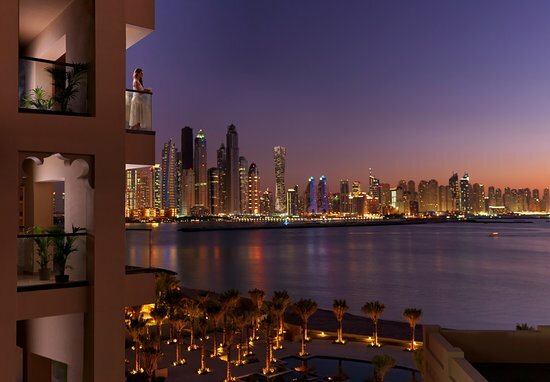 Given Dubai’s immense popularity as a travel hub and holiday destination, that concept of luxury expanded to include super wealthy hotel apartment owners. These are designed for the business travellers and families looking for a summer home, providing the twin benefits of a home that is already furnished and one that enjoys the full services and amenities of a five-star hotel. For the rest of us, such homes were a few zeroes removed from reality. However, Dubai’s property landscape of is ever shifting. While villas and mansions are still being built to court the high-net-worth buyers and the occasional celebrity, a number of projects have sprung up in the past few years that bring the idea of beachfront living to a level that is more accessible for us mere mortals. When I say mere mortals, of course, I should clarify that there is still a sizeable price tag involved – but nowhere near as hefty as what you might pay for a villa on one of the Palm tips, for example. To make things even easier, most if not all of these projects offer very reasonable payment plans as well. Dubai Marina and Jumeirah Beach Residence (JBR) have been at the forefront of this change, positioning themselves as communities with all the comforts and conveniences you would expect of a high-end seaside home at an attractive price point. But that, as we soon came to discover, was merely the beginning of a grand maritime development boom. Property giants Emaar and Meraas have launched exceptional concepts that are taking Dubai’s waterfront lifestyle to new heights while opening up the market to buyers whose pockets have finite depth. Emaar kicked off the year with the release of Emaar Beachfront, a private island community with a direct link to both the Palm Jumeirah and JBR – three towers have been launched so far. La Mer, the latest concept by Meraas, just launched its first residential project, joining the already opened beach and water park. Known as Port de La Mer, the community sits on a peninsula off the coastline of Jumeirah and will feature a yacht marina at its heart. On reading the preceding paragraph, you would be forgiven for thinking that we have once again entered the realm of the super rich. While private man-made islands may seem like something that only celebrities and VIPs would be able to afford, these projects are being designed for a much broader segment of the home buying population. The apartments will be on a more affordable scale while maintaining the highest standards of build and aesthetic quality. One only needs to look at Bluewaters Island, another recent Meraas project, to see how seamlessly these two ideas can come together. For buyers, this is fantastic news. It provides an opportunity to purchase a luxury home with the benefit of a great location and all the perks that come with it. But this also creates a lucrative market for investors who will be buying into an exciting new community. Emaar Beachfront, as an example, is going to be a hub of maritime tourism. La Mer holds the distinction of being the first freehold development in Jumeirah. These factors make both of these projects very attractive for the savvy investor. When you add in the price and payment plans that offer plenty of breathing room between installments, it is a chance too good to pass up. To those readers who have always dreamed of living in barefoot luxury, where you can feel the gritty sand sticking to your toes as a cool sea breeze washes over you, that dream is now more attainable than ever. As the saying goes, there are plenty of fish in the sea.